When families and friends visit Kansas nursing homes, they may be startled to see how listless and lethargic their elderly loved ones may be, especially if the facility residents suffer from dementia. There’s a sad, simple, and likely reason—the seniors may be drugged up with potent anti-psychotics. The Kansas City Star deserves credit for providing a powerful reminder that nursing homes, not just in the Heartland but nationwide, persist in over-relying on off-label dosing of their sometimes difficult to handle patients with drugs such as olanzapine (more commonly known by the branded product Zyprexa), aripiprazole (Abilify), risperidone (Risperdal), or quetiapine (Seroquel). 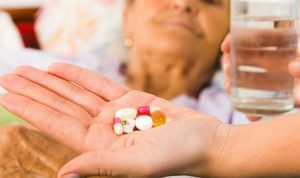 Anti-psychotics are contraindicated for people with dementia and include a U.S. Food and Drug Administration warning that they increase the risk of falls, stroke and other potentially fatal side effects. The federal government started tracking the off-label use of such medications in nursing homes in 2011. Since then, Kansas has always ranked at or near the top in percentage of medicated residents, suggesting there are thousands of residents in the state’s certified nursing facilities who have been given drugs that aren’t medically indicated for them, and could actually harm them. Patients in severe cognitive decline, especially those with dementia and related conditions like Alzheimer’s, can become a handful for caregivers, including those at nursing homes. But families and patient advocates have marshaled extensive data to show regulators why they need to keep cracking down on nursing homes getting dementia patients to be more docile and complaint with drugs because this practice is little more than a modern version of shackling them to their beds. This is cruel and unacceptable. Not only can anti-psychotics reduce individuals to a constant stupor and create serious health risks on their own, they are notoriously tricky to administer in the old, whose bodies process drugs in unpredictable ways. Seniors also too easily can be harmed by polypharmacy—situations in which their multiple doctors, unknowingly or by outright error, prescribe multiple medications for them, with some of the drugs interacting in harmful ways. Indeed, new research, as reported in the Washington Post, warns that seniors—especially those with dementia and Alzheimer’s—may be at heightened risk when prescribed benzodiazepines and related “Z drugs,” medications best known in their branded versions like Valium, Librium, Ativan, Xanax, Restoril, Serax, and Ambien. Researchers say that benzos may help older patients with agitation, anxiety, and insomnia linked to the dementia or Alzheimer’s. But the sedating drugs also seem to be tied with increase incidences of hip fractures, pneumonia, and stroke—all factors that can be significant contributors to patients’ mortality. Federal authorities have issued their sternest warnings about mixing benzos and powerful opioid painkillers like oxycodone and hydrocodone. This can be a lethal combination for young and old. In my practice, I see not only the major harms that patients suffer while seeking medical care but also the awful abuse and neglect that seniors suffer in nursing homes and the carnage that can be caused by dangerous drugs. Nursing home care isn’t cheap, hitting an annual average cost of $100,000 or so for a private room, and operators—especially big, highly profitable chains—shouldn’t be allowed to skimp on staffing that could be beneficial to residents by cutting corners and over-medicating seniors. This isn’t a problem that Kansas nursing homes alone need to address. We all need to ensure the elderly only get the drugs they need and that can help them.